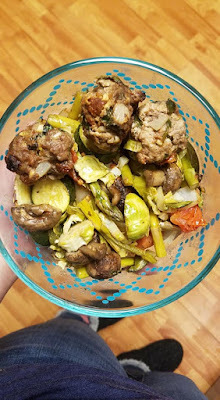 This is a quick prepped and flavor packed paleo and gluten free friendly and satisfying meal that I prepped for lunches but also makes a fabulous and easy dinner. 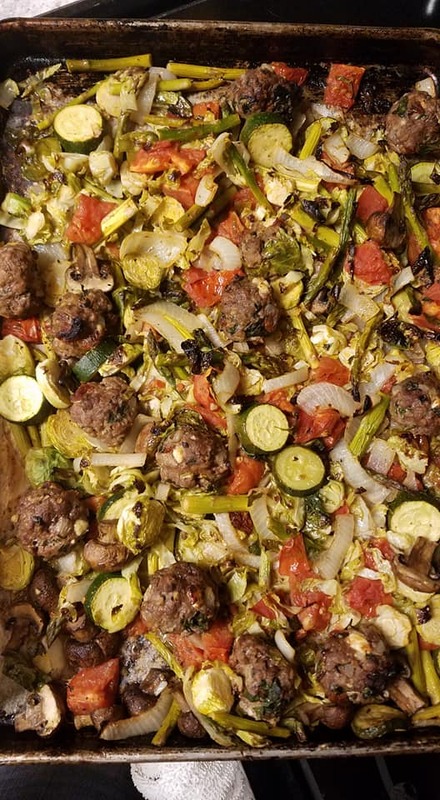 The meatballs are greek inspired and made with grass-fed beef and the vegetable medley could be a mixture of other vegetables but this group was spot on. Give it a try and let me know how you like it! Definitely a new favorite of mine. 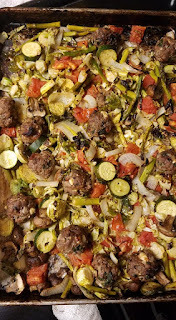 Cut up all ingredients and place on prepped baking sheet. Toss vegetables with avocado oil and homemade balsamic vinaigrette (click here for recipe). Place meatballs uncooked spread out around the pan. Bake at 400 degrees F for 15-20 minutes (you may need to drain some of the juices out at the point carefully) and then broil on high for 3-5 minutes until the veggies crisp over a little.